Microsoft has established a “special relationship” with Yahoo! and the Flickr Web site. One of the fortunate side effects of that relationship is that you can publish photos from the Windows Live Photo Gallery directly to your own space on Flickr. Using Flickr and Windows Live Photo Gallery, you can share your photos with friends and family around the world. Yahoo!’s Flickr, the granddaddy of free photo-sharing sites, offers free accounts, limited to 20MB of uploads per month. You can specify who can see your pics or open them to the world and add tags to make them easier to find. Open the Windows Live Photo Gallery. The photo gallery is no longer automatically included in the Windows installation disc. It’s available for free, though, at the Windows Live Essentials download page. Select the pictures you want to transfer to Flickr. As always, you can use the click, Ctrl+click, Shift+click, or lasso methods. Choose Publish→More Services→Publish on Flickr. WLPG tells you that you must provide authorization before you can proceed. Your favorite Web browser pops up and asks you to log on to Yahoo!. Type your Yahoo ID and password and click Sign In. 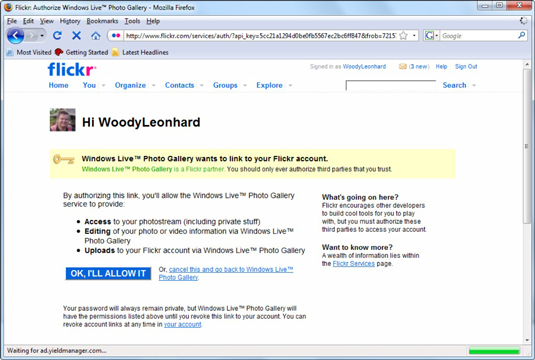 Flickr asks you to authorize Windows Live Photo Gallery to connect to your Flickr account. In Flickr, click OK, I’LL ALLOW IT. Flickr tells you that you’re good to go. Close the browser. Back in WLPG, click Next. 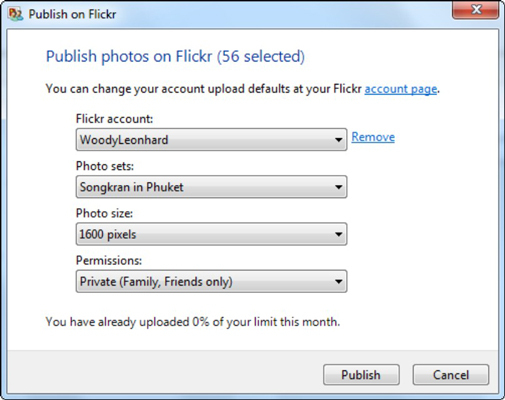 WLPG shows you the Publish on Flickr dialog box. Select your publishing options. Then click Publish. If you want to create a new photo set (an “album,” if you will), click the drop-down box below Photo Sets and choose accordingly. Adjust the Photo Size to whatever you like and choose the correct permissions. Then click Publish. That’s all it takes. Your photos are uploaded to Flickr according to your wishes, stuck in the album, er, photo set you specify, and given the permissions you requested — even the tags you assigned in WLPG are intact. And, the photos are available immediately to anyone who can open your Flickr page. Now that you’ve set up the authorizations, you won’t have to go through that again. Uploading photos to Flickr is almost as fast as copying them to another computer.